How many African Green Monkeys are infected, euthanized and then organ harvested each year to make FDA-approved vaccines? 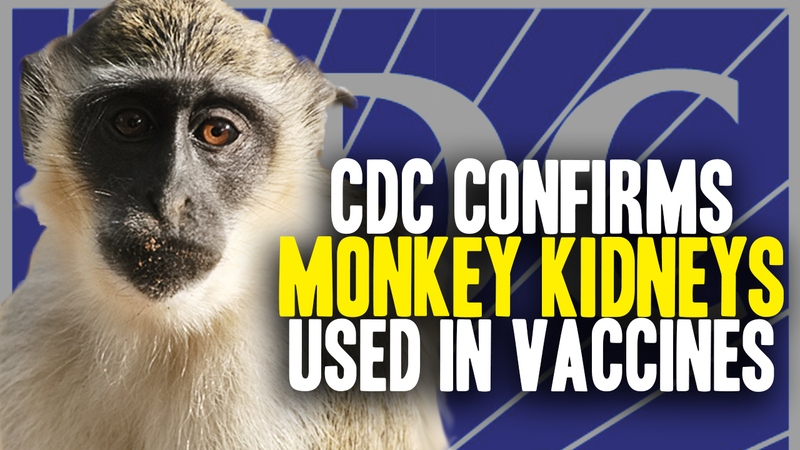 (Natural News) Now that it’s been proven that vaccine manufacturers harvest kidney cells from African Green Monkeys to produce vaccines that are injected into children, many are now wondering just how many of these monkey are captured, euthanized, and processed into vaccine ingredients each year to make these FDA-approved poison jabs? As you may recall, Natural News was falsely accused of spreading “fake news” after breaking the story on African Green Monkey kidney cells, and other horrific ingredients, being used in the manufacture of vaccines. For merely publishing the ingredients listed on the vaccine package inserts that manufacturers are required to provide with their vaccines, Natural News faced an unrelenting barrage of fact-less criticism. You can see the list of ingredients yourself, published by the CDC, at this Natural News article link. Parents: are you aware of all the horrible things being injected into your children? Knowing that millions of vaccine are produced and administered every single year for injection into children, it boggles the mind to consider just how many of these African Green Monkeys are being subjected to death in order to manufacture them. The number has to be at least into the thousands, though no official number has been released by the CDC. Many of these same vaccines also contain cells from aborted human fetal tissue, which sheds a whole new light on Planned Parenthood’s illegal baby harvesting scheme that involved selling aborted baby body parts to biotechnology companies for use in manufacturing “medicines.” It is now abundantly obvious that Planned Parenthood was trafficking those baby body parts for potential use in vaccine manufacture. This is in addition to all the viruses, heavy metals, chemical preservatives, food colorings, and other toxic ingredients used in making vaccines. Children today are being injected with some of the most disturbing and poisonous substances known to mankind, and very few people seem at all concerned with what’s going on. It’s probably because so many people don’t even know what’s going on, thanks to the mainstream media’s dereliction of duty in reporting on this important subject. Every parent should be required to peruse a vaccine package insert before injecting his or her child with a vaccine, and yet this is rarely the case. Most doctors fail to inform parents about the presence of both human and animal tissue in their children’s “medicine,” for instance. They rarely mention the use of toxic mercury (thimerosal) in vaccines, or other noxious ingredients like aluminum, genetically-modified (GM) byproducts, cow blood, chemical solvents, and more. These additives are certifiably NOT safe, and they serve no beneficial purpose for those into whom they’re being injected. “Several vaccines currently available in the United States were developed using the Vero cell line, started from African green monkey kidney cells,” explains The History of Vaccines.